Harcourt is a rural township on the Calder Highway and the railway line from Melbourne to Bendigo. It is 9 km north-east of Castlemaine and on the western side of the Mount Alexander range. To the east of the town is Barkers Creek, a stream which flows towards Castlemaine and which was the site of much easily won alluvial gold during gold rushes in 1851-52. Mount Alexander is the dominant landscape element at Harcourt. (It was named by the New South Wales Surveyor-General in 1836 after Alexander the Great.) In 1845 Dr William Barker acquired the Mount Alexander pastoral run and built a homestead beside Barkers Creek, Harcourt North. The gold discovery at Specimen Gully, on the Barkers Creek, was reputedly made by employees of Barker in 1851. Harcourt township was surveyed in 1853, on the junction of the roads to Bendigo and Castlemaine near the Barkers Creek. It was named after Sir William Harcourt, English Chancellor of the Exchequer. Harcourt was slightly outside the Castlemaine goldfields. Its activities were chiefly agricultural, supplying vegetables and dairy goods to Castlemaine. A school was opened in 1859, a Methodist church in 1864 and a railway station in 1863 when the line was opened between Kyneton and Bendigo. There was a hotel and several quarries for building stone. During the 1860s orchards were planted for pome and stone fruits. By the 1880s the chief planting were apples, pears and cherries. In 1881 a water-supply channel from the Coliban system for sluicing gold at Specimen Gully was tapped for irrigation of the Harcourt Orchards. A reservoir had been built north of Harcourt on Barkers Creek by 1868 and a local irrigation trust was established in 1889. The real benefits of irrigation came with the State Rivers and Water Supply Commission (1905) which took over the Coliban water storage and irrigation system. The Harcourt valley, between Mount Alexander and Bald Hills, became an apple orchard area which produced export quality crops, and much of the town’s housing stock can be dated form that period. The town’s prosperity is visible in the well laid-out Stanley Park (1914) with monuments and mature exotic trees. A co-operative fruit-drying company was formed 1908. 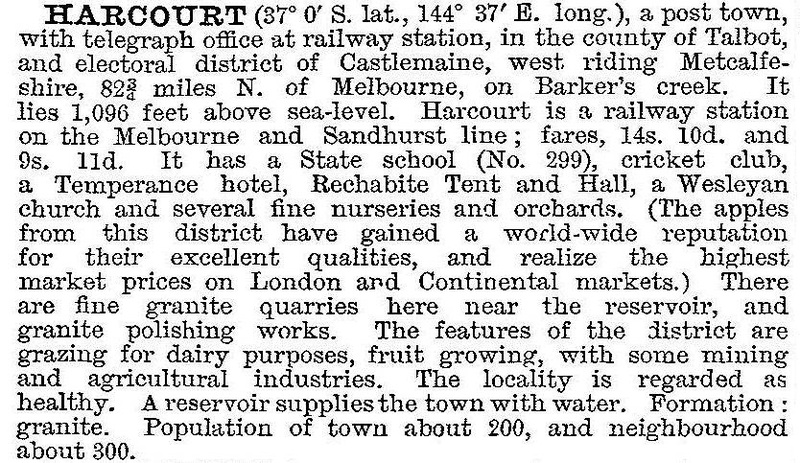 The Harcourt granite quarries, east of the town in the Mount Alexander State Park have supplied much of the granite used for buildings and monuments locally and in Melbourne (Flinders Street Station). They have been an important source of employment during building booms. A heritage study (1994) identified over 30 sites and buildings worthy of note. They included a fruit-packing shed (1940s), railway bridges, an unusual Australian Natives Association hall (1911), several houses and the former railway station. The station, made of bluestone, brick and granite, was built in 1863, and after closure in 1969 has been used by a community radio station. It is on the Victorian Heritage Register. Harcourt retains its orchards and cool stores, and has a school (73 pupils, 2014), three churches, a heritage centre in the ANA hall, a reserve and sports facilities, a swimming pool and a motel. Orchards have diversified into cider production and table wines. On Mount Alexander there are television and radio transmitters, two lookouts, a koala sanctuary and granite quarries. In 2013 the town centre was revitalised to create a village feel, following the Calder Highway bypass (2009). Harcourt received the NBN in 2014.